Hugh Brier awarded GRDC’s Seed of Light, Northern Region. Melina Miles March 7, 2014 January 23, 2019 1 Comment on Hugh Brier awarded GRDC’s Seed of Light, Northern Region. DAFF Queensland Entomologist, Hugh Brier, is the 2014 Northern region recipient of GRDC’s Seed of Light. The Seed of Light is presented each year to someone who makes a significant contribution to communicating the outcomes of research. Hugh started with the Queensland Government as an experimentalist in 1974. 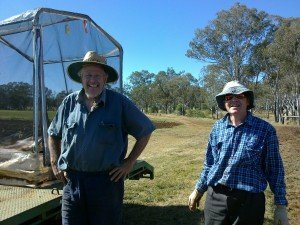 First based in Toowoomba; having completed a degree in Agricultural Science at the University of Queensland before being transferred to Kingaroy in 1975 where he has been ever since. Initially under the supervision of John Turner, and later John Rogers, Hugh learned to love peanuts and soybeans. 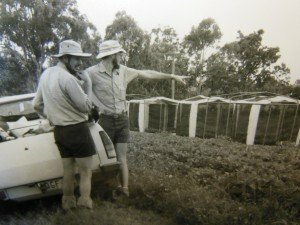 In the late 1970s and into the 1980’s, Hugh did the original survey work on peanut white grubs in the South Burnett, including that tedious process of associating larvae and adults by rearing stuff through. Hugh got interested in pod-sucking bugs in the 1980’s and from about 1986 onwards he and John Rogers used large field cages to work with Helicoverpa and bugs. While John was working out Helicoverpa economic thresholds, Hugh was identifying the key crop stages for bug damage, and the relative damage potential of the different species. This work went on for quite a few years, culminating in the award of a Masters degree from The University of Queensland, and subsequently promotion to the position of Entomololgist. In more recent times he has pursued the development of economic thresholds for helicoverpa, mirids and podsucking bugs in mungbeans and soybeans. 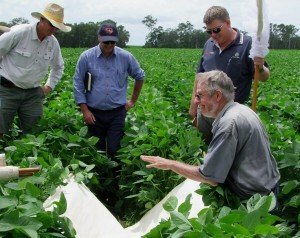 His passion for Integrated Pest Management has spawned IPM courses for coastal soybean growers, and he has played a key part in enabling the developing the coastal soybean industry in Queensland. Hugh has generated data to support permits and registrations of IPM-compatible insecticides for these minor crops. He has produced numerous publications to assist growers and agronomists in correctly identifying and managing the multitude of possible insect pests in pulses. He is rightly proud of his achievements in these areas; a significant chapter on summer pulses in the 2007 Pests of Field Crops and Pasture book (PT Bailey ed); the IPM workshop manuals and agronomist accreditation manuals, and more recently the Good Bug Bad Bug book– to name just a few. While he has been a bureaucrat’s nightmare, he has always had the best interests of industry at heart and developed strong, practical relationships with farmers. 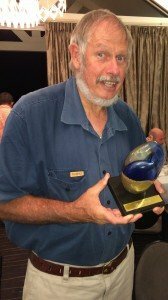 He has always done more than he ever needed to do with his trials, often at the expense of his technical support toilers – Joe Wessels in particular. Scientific publications languished as Hugh did what he loved, getting into the field with growers and consultants. His findings are being used in day to day pest management, and his commitment and passion for pulse entomology and the pulse industry is unrivalled. Anyone who has been at one of his presentations will be well aware of his quirky sense of irreverent humour, and his love of colour and movement. Any biography of Hugh would not be complete without a mention of his love of locomotives, and the constant support of his wife, Cathy. Hugh doing what he loves – communicating with industry. Hugh with his long-suffering technical assistant, Joe Wessels. Well done , a well deserved recognition.